Best in Class, Grass drawer systems are now backed by a Lifetime Warranty, allowing you to sell with absolute confidence and security. Grass systems are manufactured to the highest industrial standards and are ISO9001 certified. They offer absolute reliability, functional comfort, technical precision, progressive design, tested quality and exemplary respect for the environment. A perfect match for Häfele. 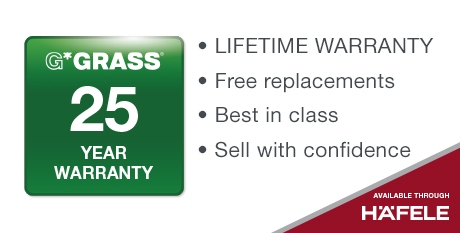 What does the Grass Lifetime Warranty mean for you? When you sell a Grass drawer system, you are selling one of the highest quality products available on the market, now backed by a lifetime guarantee of 25 years you have additional security in your purchase. Although issues are extremely rare, Grass promise to replace any Grass product that does not perform to the expected high standards. Upon the rare occasion that you find the Grass product you have purchased does not perform according to specification, Grass will replace or repair the products free of charge. For more details about the replacements and repairs, please read the full warranty here. Under the Grass warranty, you can have absolute peace of mind that the Grass systems that you receive are industry-leading best in class. In March this year, Häfele were thrilled to announce the latest development in their partnership with Grass with the launch of the Dynapro Tipmatic Soft Close, which Häfele remain the primary distributor for. 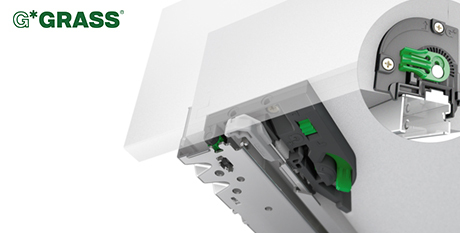 The Grass Warranty isn’t the only stamp quality that comes with Grass drawer systems. In April, Häfele unveiled the next step in the partnership with Grass, with the launch of the new Nova Pro Scala drawer system. 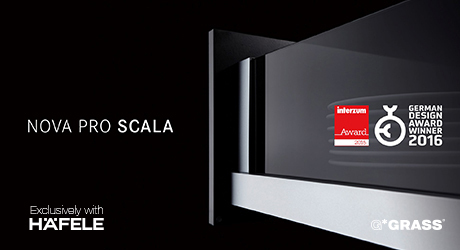 The Nova Pro Scala Drawer System was awarded with the German Design Award 2016 for setting “ new visual and functional standards”, as well as taking away the “High product quality” award at Interzum 2015. Synonymous with excellent quality, stability and with smooth-glide double-wall drawers, the latest development in the Grass Nova Pro brand took all these exceptional features and pushed them into the future. With space optimisation like never before, innovative soft-close technology and absolute individualisation, Nova Pro Scala focusses on occupying the minimum amount of space, to give maximum scope for bespoke creativity.